"Soldiers about to go to the trenches take part to the Holy Mass celebrated on the hillock of an old mill in Flanders." Two of the four remaining post mills on the north-eastern side of the city walls. 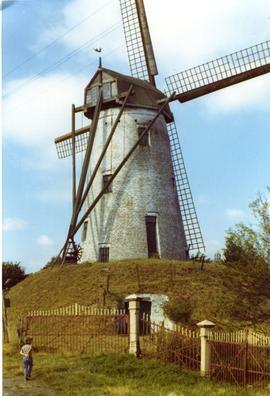 Monument to the artillery duel that was fought in Rotselaar in the First World War, known as the ‘Slag aan de Molen’ (English: Battle of the Mill). Postcard celebrating the defense and resistance of the city of Liège to the German army in 1914 for which it was awarded the Légion d'Honneur in 1914. A poem by E Schwartz about war and death and the symbolic nature of the windmill as calm and peace. Original etching of a post mill near Yser, Belgium, during Battle of the Yser when the area was flooded for defense.